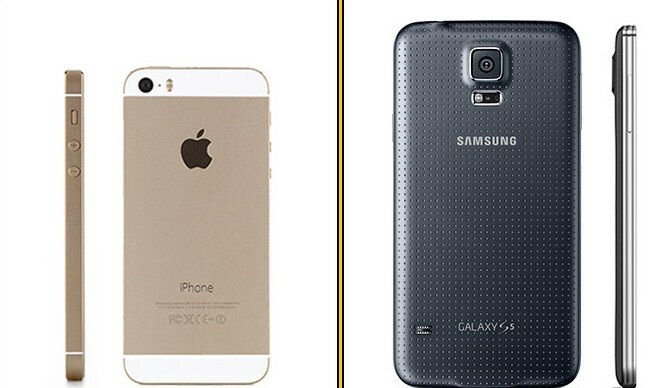 In the event that you want to buy a new smartphone, there is a huge possibility you will choose Samsung or Apple. These are the 2 companies that hold 2 thirds of the entire market and the flagship smartphones are the Galaxy S5 and the iPhone 5S. Let’s take a look at the options that are currently available so you can make an easier choice. The Samsung Galaxy S5 is quite hunky and large. Apple shows a compact aluminum body and better polished edges. When referring to aesthetics, it is obvious that the iPhone 5S look better. It has a more premium feel and look. It is smaller and lighter. When referring to the display, Galaxy S5 obviously wins when thinking about size as it features a 5.1 inches screen as compared to the 4 inches screen of the S5. When referring to the image quality, both models are impressive in different ways. Samsung has an impressive color saturation and the brightness is practically the same. However, Samsung’s display is better. When referring to audio, iPhone 5S clearly wins in terms of clarity and volume. S5 vocals are too distant. When comparing the iPhone 5S and the Samsung Galaxy S5, the interface offered by Apple is definitely the best one. However, Samsung did manage to offer a better option with the upgraded TouchWiz. Apple’s interface is more intuitive and more attractive. This is obviously really important. Both smartphones have a lot of specs. The CPUs are really good and Samsung has 1 extra GB of RAM available. We would expect to see faster operation but the truth is that the iPhone 5S is swifter. This is something that you will obviously appreciate. Samsung Galaxy S5 has a 16 MP camera and really good features. The iPhone 5S is 8 MP short and Samsung also allows you to preview the images before you shoot so that you are 100% sure that the quality is really high. It is really easy to get creative when using Galaxy S5. When talking about camera quality, both models have a similar quality outdoors. 5S will perform better when faced with low light and S5 does a great job with its front camera. The most important special feature offered by iPhone 5S is the Touch ID sensor. It allows you to unlock your phone and make purchases from iTunes with ease. You cannot do something else with the feature though. Galaxy S5 includes a fingerprint reader that even allows you to buy with PayPal. However, the sensor is not always accurate. Related: What Should You Know About The New IPhone 6 And IPhone 6 Plus? S5 includes different special features that are not available with the iPhone 5S. For instance, you have access to Multi Window, a feature that allows you to open 2 applications side by side. Ultra Power Saving Mode will disable all features that are not necessary. S5 does offer more for the smartphone. Samsung Galaxy S5 ha a big battery when compared to the S4 and it will show. This smartphone’s battery will last longer. Google Play Store has a huge app selection but Apple App Store does have the hottest and newest games and apps first. Also, the Google Play store does not have some of the strong apps. On the whole, the Samsung Galaxy S5 does win. It is better and this is the one that you want to buy!